Celebrate the birth of a newborn baby with this pretty arrangement of white or cream roses with pink alstroemeria and baby's breath. Lovely. Chisinau Flowers - the best way to send flowers to Moldova. 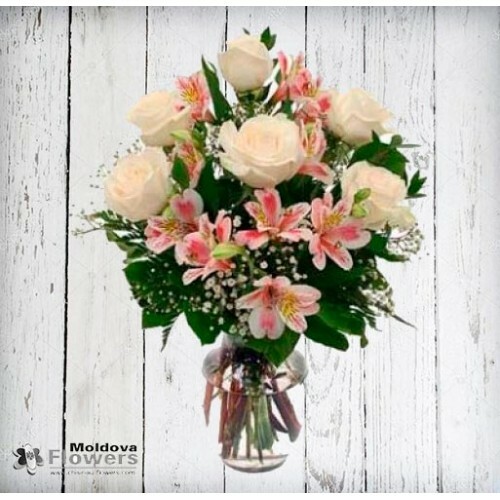 Try our Moldavian flower delivery service, and you won't regret. Always best quality, price and customer service. When you order flower bouquet or composition, they will be produced as closely as possible to the picture. Please remember that each bouquet is hand made. No two arrangements are exactly alike and color and/or variety substitutions of flowers and containers may be necessary. Some items may vary depending season and availability in certain regions..
On our website you can order flowers and gifts delivery to any destination in Moldova. Our flower delivery service offers only best quality flowers and gifts. You can choose from wide range of bouquets and arrangements for delivery to your friends, relatives or business partners in Moldova . Anenii Noi, Balti, Basarabeasca, Benderi (Tighina), Briceni, Cahul, Calarasi, Cantemir, Causeni, Chisinau (Kishinev), Cimislia, Criuleni, Donduseni, Drochia, Dubasari, Edinet, Falesti, Floresti, Glodeni, Hincesti, Ialoveni, Leovo, Nisporeni, Ocnita, Orhei, Rezina, Ribnita, Rishkany, Singera, Soroca, Stefan Voda, Straseni, Taraclia, Telenesti, Tiraspol, Ungheni. For delivery to other cities of Moldova, please contact us.